Click on “Click here to register” in the upper righthand corner of the page and follow the steps to create an account. After you’ve created your account and signed in, type “WSUM” into the search bar at the top of the page. Set the record time. 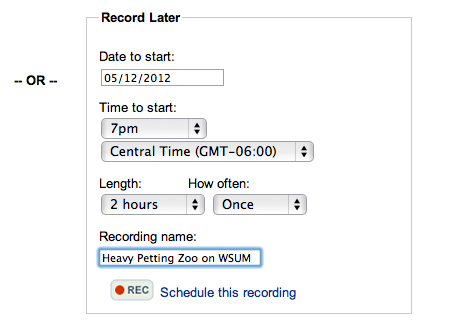 You can choose to record on a specific date or to record on a weekly basis. Be sure to set the start time at 7:00 p.m. Central Time (GMT-06:00). The recording length is 2 hours. After the show, you can play it back under the “Player” tab. You can also find instructions for mobile downloading and playback under the “Devices” tab.